The Reagle Music Theatre of Greater Boston prides itself on offering suburban audiences “Broadway at your doorstep.” And the Reagle delivers a reasonable facsimile with its final production of the summer, “Singin’ in the Rain,” playing the Robinson Theatre in Waltham through Sunday. Just remember that this musical adaptation faithfully follows the classic 1952 movie set in 1920s Hollywood, so in addition to singing and dancing, it’s got a strong whiff of yesteryear about it, from the broad characterizations to the cheerfully old-school plot. If you bring the grandchildren — as a number of folks in Sunday afternoon’s nearly full house seemed to have — you needn’t worry about sexuality or profanity or a loud onstage rock band. On the other hand, you may have to explain to the kids about silent movies and the transition to talkies. For those who haven’t Netflixed the movie lately, this is the story of silent-film stars Don Lockwood (Sean Quinn) and Lina Lamont (Noreen Hughes), a nice guy and an egomaniacal ditz. Their on-screen pairing is helped along by a well-publicized but fake off-screen romance. Well, Lina thinks it’s real, but she’s not too bright. Don meets cute with the aspiring actress Kathy Selden (Gillian Mariner Gordon) and they fall in love. When the arrival of talkies threatens Don and Lina’s careers — she’s got a voice like fingernails on a blackboard, whether talking or singing — Don thinks dubbing in Kathy’s voice is the answer. Complications, of course, ensue. 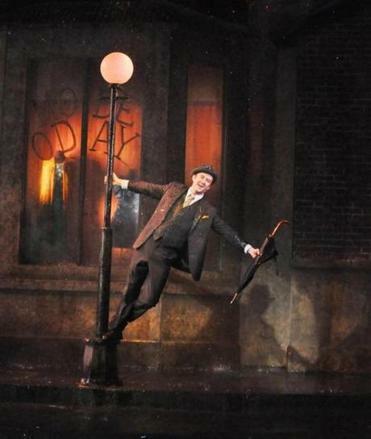 The plot is largely something to hang the musical numbers on, including “Singin’ in the Rain” itself, which finds Don twirling around a light pole in a downpour. Sunday’s performance was undercut, though, when Don’s vocal seemingly fell victim to an issue with his body mike, leaving Quinn not fully audible for a good part of the song. Ironically enough for a show about the transition to sound entertainment, the microphones were a recurring problem. And yes, there was a real downpour on the stage for this song, which closes the first act and is reprised at the end of the show by a squad of dancers in yellow slickers. Kudos to Reagle for putting a couple of dozen ensemble members onstage for the finale and other numbers in a time when most theaters keep cast size to a minimum. It makes the show look and sound alive. There were plenty of other sturdy numbers here, notably “Make ’Em Laugh!” sung by Don’s sidekick, Cosmo Brown (Edward Tolve), and the perky “Good Morning,” by Don, Cosmo, and Kathy, with some comfortable physical humor. Don is sort of a generic good guy in this performance, which may have more to do with the way he’s written than with Quinn’s performance. But Gordon and Tolve were the standout performers Sunday, giving nuance to the conflicted Kathy and the ever-energetic Cosmo. Hughes got plenty of laughs as the screechy Lina. The dancing was fine but, of course, short of the sublime precision of Gene Kelly and company in the movie. That’s a high bar. Further kudos to Reagle for employing a live pit orchestra with reeds, brass, and strings under conductor Dan Rodriguez. They sounded great from overture to finale, a rarity in an era when small combos with lots of synthesizers are the norm. This is one touch of yesteryear that should be a lot more common.